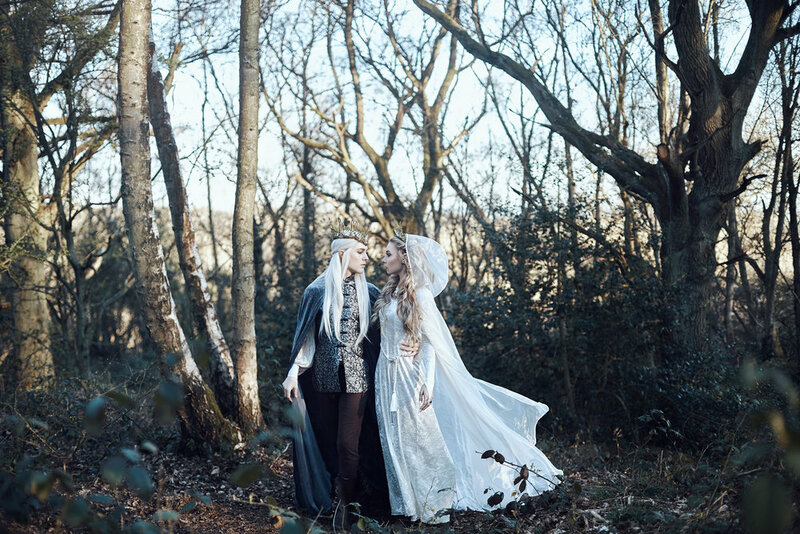 When Ian reached to me with the concept of shooting a Tolkien inspired set for Faerie Magazine's upcoming Tolkien issue to say I was excited would be an understatement. Living in Oxford, England, the same city that inspired Tolkien's Lord of the Rings, I've always felt an affinity with the world around me. Walking in the woods, under tall trees and winding branches that inspired the Ents, and the rolling landscape of green grass with little thatched roof cottages reminding me of the hobbit's Shire. A world of magic created in the world I walk in. This connection is something I wanted to bring to life for this series. After brainstorming ideas, Ian pulled the shoot together, it's something he loves to do and I can honestly say that he excels at it. He organised the styling and brought his skills to the hair and makeup. Ian recommended Vix Fielder who I believe made a beautiful Elven queen. We shot the series on a cool, crisp day, little blossoms surrounded our couple as they embraced in Spring's arms. The woods in Shotover Park was our backdrop. I'd chosen it for its variety of trees, I wanted to capture a sense of a journey through the change of natural scenery. I hope you enjoy the art we created. Thank you Faerie Magazine for publishing this shoot as your front cover!